I'm new to the jeep community, just bought a 1998 Grand Cherokee this last weekend. Haven't had any issues other than the digital display at bottom flashing, though I think I've gotten that fixed now. Had to take a small trip after work yesterday and drove for an hour and a half straight, no issues. This morning I let it warm up for 15-20 minutes before I got on the road headed to work. After driving for about 10 minutes the "check gauges" light came on, so I quickly checked the gauges. Temp was pegged out, battery was at 0. I slowed down a lot at this point and temps started to drop a little. I figured since it was 2 degrees outside, the air would keep it cool enough to finish driving to work slowly. Started making a bit of slight knocking/tapping noise in which I ended up pulling off on the side of the road. When I came to a stop and then let go of the brake, I realised the engine had died. I sat to let it cool down, once it got close to the mid mark on the gauge I tried to start it, but just got a "whirring" noise of sorts. I had someone coming to pick me up and just before they got there I had gotten the engine to start by giving it gas as I turned the key. A notice "low coolant" was on the bottom display yesterday, but I forgot to do anything about it. Had my girlfriend buy some coolant and pick me up from work today. I poured the entire bottle in, didn't see any leaks dropping out and decided to try and drive it home. Ended up running at the 3/4 mark on temp gauge the entire trip. 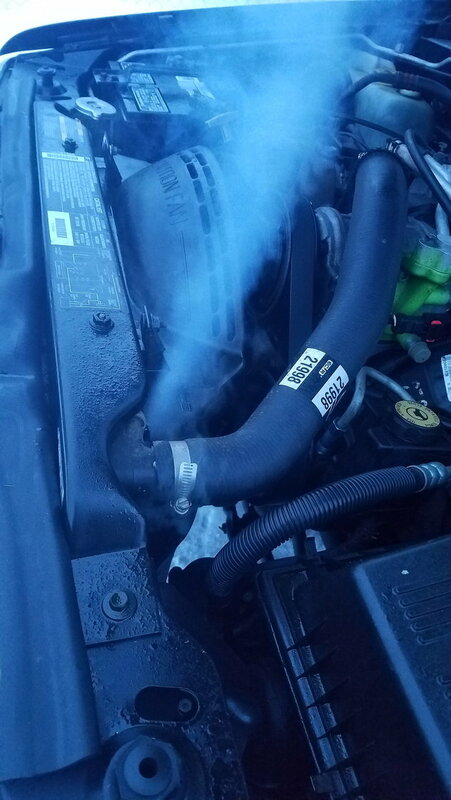 When I got home steam was blowing hard from the radiator hose on the driver side top of the radiator. I'm hoping I can push the hose on better and tighten the clamp down and issue solved, but I'm looking for advice on what may be wrong, what I need to check, etc. I don’t know where to start ... you handled this situation the wrong way ... you shouldn’t of driven before investigating the low coolant situation or at a bare minimum topping it off . When it got hot you shouldn’t of went any further and had it towed or attempted to repair it on the side of the road . Anyways ... I’d say you did permanent damage . Whenever they get so hot that they shut down it is never good at all seen many an engine ruined that way. If it helps any, which I'm sure it doesn't, it didn't shut off until I came to a stop. I didn't drive it much past overheating, maybe a couple minutes at most. I let it sit instead of trying to drive it once it started, until I was able to put coolant in it. There's a chance its damaged, but there's also a chance that it's not and I'd like to get ideas of what to look at and for.